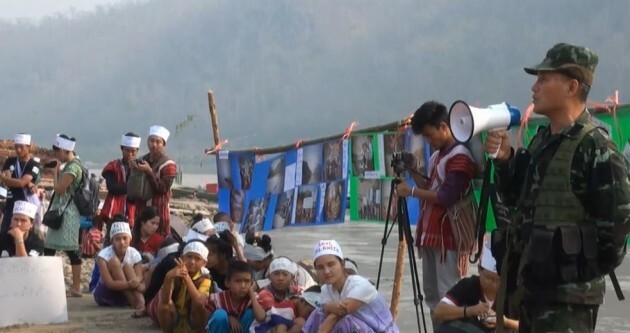 A coalition of Karen environmental community based groups, the Karen River Watch, joined with local villagers to protest the building of hydro-power dams on the Salween River. The protesters called for all mega hydro-power projects on Salween River to stop. The protest marked the International Day of Action for Rivers and Against Dams, held each year on March 14. Representatives from KRW gathered together with villagers on the banks of the Salween River in Papun Township, Karen State to protest and to demand the Karen National Union and the Burma government stop all mega hydro-power dam projects until a concrete peace agreement is reached. Naw Hsa Moo, the media coordinator of the Karen Environmental and Social Action Network, a member KRW, spoke to Karen News about the demands. Sources from KRW explained to Karen News that in 2014, to secure the contentious Hat Gyi Dam site there had been an increase in the number of government troops and its militia, the Border Guard Forces, in the area. Hat Gyi Dam in Hlaingbwe Township is one of the planned five (?) hydro-power dams on the Salween River. KRW said that the increase of government soldiers in the area raised tensions between the armed groups and had resulted in conflicts between government forces the Karen National Liberation Army and the Democratic Karen Benevolent Army. General Baw Kyaw Heh, Vice Chief-of-Staff of the KNLA joined the protest on the Salween River and said that he is on the side of the people. The dam protesters were joined by internally displaced people from Ei Tu Hta camp, local KNLA officers, representatives from KRW, KESAN, the Karen Women Organization, Karen Youth Organization, Karen Student Network Groups, Federation of Trade Union Kawthoolei and the Karen Office of Relief and Development. Among the 800 protesters, were banners that read, Keep the Salween Flowing, Salween is our life and No Dams. The protest was followed by speeches by KRW representatives and local community leaders who aired their concerns about the proposed dam projects. Saw Nya Htaw, the chairperson for Ei Tu Hta IDP camp spoke to Karen News. Ethnic community-based-organizations and local villagers along the Salween River have been calling for a stop to the dam projects since the previous military regime of Burma had a plan to build 18 hydro-power dams on the Salween River, in Shan, Karenni, Karen and Mon States. Similar protest to mark the International Day of Action for River and Against Dams were held on March 14 in Karenni, Shan and Kachin States.